At 3:00, PM, IST, the rupee was trading 69.02 against the dollar. 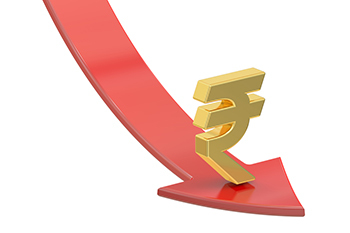 The Indian rupee is oscillating between its gains and losses on Friday with the domestic unit erasing morning gains and depreciating 27 paise to trade at day’s low level of 69.10 against the dollar in the afternoon session. At 3:00, PM, IST, the rupee trading 69.02 against the dollar. In the morning trade on Friday the unit gained 26 paise to trade at day’s high level of 68.57/$ and opened 23 paise up at 68.60/$ compared to its previous close of 68.83/$. The rupee volatility is a mirroring effect of range-bound session in the domestic equity markets. The BSE, NSE opened in the green on Friday, however trading in the red during the last trading hours. The Sensex dropped 264 points at 38,120 levels and the Nifty slipped 75 points at 11,446 levels, slightly below its key level of 11,500.